CDG Paris Charles De Gaulle Airport to New York. I'm sad because I had to leave my children in Paris and can not be at the first day of school with my daughter Marylou. Her brother Ulysses will take care of her at the schoolyard. On the one hand, it is always hard to leave his family home, but on the other hand, I can not sit quietly and really, I love to travel and experience new things. Continue through the Security and towards Air France lounge to drink coffee and i run into two old friends: Denis, head of an event company and head of IMG France and manager of Marion Bartoli. Of course we are talking about tennis and Marion, how happy she is to have ended her career. For me, this decision is very strange. Why did she do that now? The day when everything went great, she finished her career, without telling anyone beforehand. She will spend her time in the future for example with shopping in NYC, music, her passion for the football club Olympique Marseille - she is in constant contact with the players - and she learns how to put on high heels - ok why not? This is just a way to spend her life ... she just discoveres many new things. I know of course that you need here, more background to understand her decision. Marion is a smart and very nice girl and she is different from other players, she is a very special type. But what has changed since this extraordinary victory at Wimbledon, why does she really stops? I, who once won the final of Roland Garros, yes that is true, and indeed in 1984 with Yannick! Think of the Davis Cup victory in 1991, the lost final of Roland Garros 1988 against Mats ... If I had the chance to win Wimbledon, nothing could stop me to keep going. I would have enjoyed every moment until the next year and would have returned back to this magical place. I hope she will not regret it, but that's just my opinion. Marion joins us now on Eurosport and will share her comments with us, I'm looking forward to it. I make myself comfortable in the incredible A380. Will check out the movie "Oblivion" with Tom Cruise. Not bad, a lot of special effects but the story rather a bit poor. The food is good and the service was great: friendly crew! Drink plenty of water during the flight because you get slightly dehydrated. Fourteen days in New York, the city of dreams, the city where anything can happen! New York is the American dream. Big Apple, madness, diverse people, Central Park - which for us the Bois de Boulogne, Paris ... But even the smells of hot dogs, people everywhere, always something to eat and drink all the time. Everywhere shouting. This city is my dream, I have so many memories and in the next few days I will share this with you - humorous and also serious. The Leconte way - what else! We have a lot of turbulence on the flight and next to me is a woman who knits to overcome her fear. I think of my grandmother who knitted me a hat in the winter once. The last Grand Slam tournament of the year - but without Maria Sharapova, Jo-Wilfried Tsonga and Gilles Simon. Serena Williams and Andy Murray are defending champions, Roger Federer is currently only ranked 7 in the world rankings and could meet in the quarterfinals Rafael Nadal. 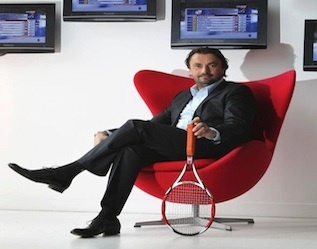 The Eurosport show 'Avantage Leconte!' live for the first time at the U.S. Open! Every day Henri Leconte and the Eurosport team report the highlights of the day (excerpts here on the blog). Henri also regularly shares his personal experiences and impressions of the tournament plus behind the scenes stories.